Slinging.org Forum - Cross Golf Ball - could be perfect ammo ? Slinging.org Forum › General › General Slinging Discussion › Cross Golf Ball - could be perfect ammo ? Cross Golf Ball - could be perfect ammo ? I was extolling the virtues of slinging (complete with demo) to a client yesterday and he showed me a box of cross golf balls (after I'd mentioned the slinggolf concept). For those who have never heard of cross golf (most of us I suspect - there was talk of building a course in the area earlier in the year so I'd heard of it). It uses rugby/american football shaped golf balls and nets. Apparently with the correct stroke you can make a cross golf ball travel in just about any direction you like including 'S' shaped paths. For our interest however what you essentially have is a glande shaped golf ball a little heavier and denser than a standard golf ball (almost 2 ounces) and dimpled for extra distance in flight. If we can make moulds they might end up being the perfect distance ammo. Re: Cross Golf Ball - could be perfect ammo ? Someone already mentioned those golf balls, but they were quite expensive, weren't they? Someone near where I live hits old range balls into the woods and I often find them hiking/biking. 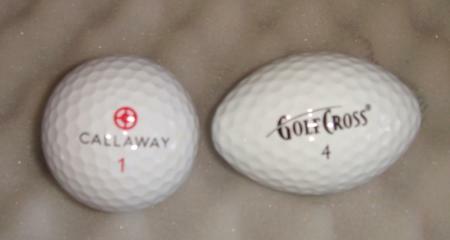 I have found a couple of these cross golf balls and they do fly much straighter than a regular golf ball. I have found that when slinging a normal golf ball it tends to slice or hook, I dont remember which. I thought this had more to do with the dimples than the shape but the cross balls are dimpled too and they fly ust fine (and wicked far). I am fortunate enough to have a friendly driving range where they'll let me sling a bucket of balls if its not too busy but if i brought my own balls I'd probably never see them again. Bear in mind the shape of the ancient roman cast lead shot, most are shaped like the cross ball, ''bicone'' shaped. Slingers early on knew the advantages of this projectile shape. Well we'll be trying them for distance at slingfest - so I'll let you know how they fly. The dimples create little vortices in the air that reduces the drag of airflow over the golf ball and lets it fly farther. okay an update on the golfcross balls. But it does straighten itself out in flight and goes straight as an arrow. So yep golf cross balls do make good distance ammo. San Fransisco Bay Area, U.S.A. Perfect in every way except price! The likelihood of recovery of the projectile varies inversely as the cube of the distance thrown, so if by some miracle I managed 300m, the chances of my finding the little mongrels would be close to zero. Makes sling ammo right up there right up there alongside exotic centre-fire cartridges costwise. Nice egg shaped lead sinkers would have to be cheaper and as good if not better performers. For the still wealthy, but environmentally conscious, a nice easy alternative is to get two 1/2" or 5/8" dome nuts and join them with a short piece of threaded rod so the flanges are touching. This would form a nice bit of hefty hex bar with rounded ends. Should fly as well as lead glands and eventually rust away when inevitably lost, with no environmental impact. Physical impact from one would be massive on the other hand. But I'm still saying make a mould and make your own cheaper versions. What will you cast them from? Please post details if it works. But I'd be inclined tomake a rubber mould and cast from clay or plaster (if I could be so inclined at all). Size for weight clay would be about right also pretty cheap. original golf cross ball thread.